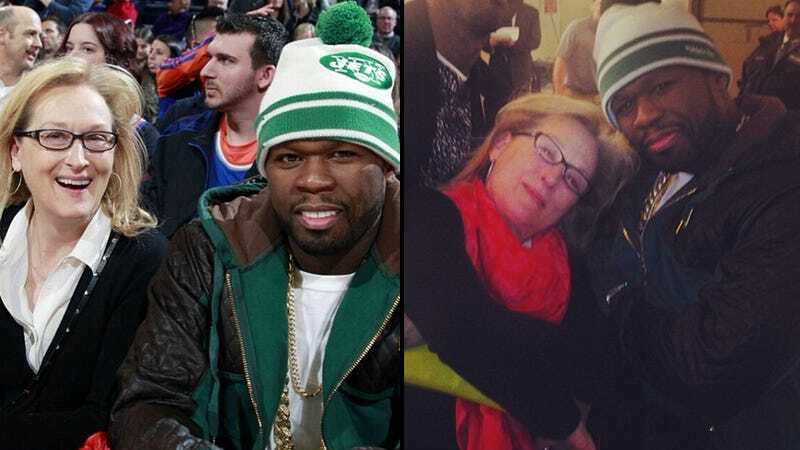 Last night in New York, the Knicks vs. Lakers game brought out celebrity fans — including one Ms. Meryl Streep and one Mr. Curtis Jackson, aka 50 Cent. The New York Daily News has a picture of the two talents clasping hands; the digital media coordinator for the Knicks called them "two peas in a pod." The best part about it is how they both seem genuinely thrilled. Caption: "Best ball KOBE, Best Rap 50,Best Actress Meryl Streep. TOP THAT"
Caption: "Things got a little gangsta. Lol TURN UP, Turn Down for what!" Caption: "Man I got a good life man lol"
Also elated was Kobe Bryant, who posted the photo below on his Instagram account with the caption "#50 #merylstreep #respect #legends That's All.."